RIO DE JANEIRO, BRAZIL – Military police in Rio were placed under investigation on Wednesday by the civil police for the suspected execution-style killing of six men last Tuesday, February 4th, in a favela in the city’s Zona Norte (North Zone). The inquiry comes after photographs published on an unofficial military police social network page seemed to show six corpses in a pool of blood surrounded by police officers in Morro do Juramento in the neighborhood of Vicente de Carvalho. A 2013 police patrol Complexo do Alemão group of favelas, photo by Operação Rio de Janeiro/ABr. The caption to the photographs, which have since been withdrawn, stated that the operation was a reaction to the killing of military policewoman, Alda Rafael Castilho last Sunday. On Wednesday, February 5th, two more men were shot by police on the third day of the concerted counterattack. Sunday’s attack on the police, which triggered the latest round of violence, took place in the Complexo de Alemão favela, which has reflected the ongoing challenges of the city’s police pacification program. 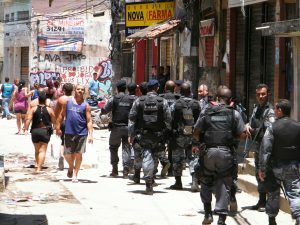 The Complexo do Alemão, an area encompassing fifteen communities in the Zona Norte, was occupied by military forces in November 2010 occupation, and has since received four Police Pacifying Units. It will be seized on by skeptics as a further sign that Brazil’s policy of favela pacification is failing and that the Red Command drug-trafficking gang is moving to retake territory lost to the UPP. It is also evidence of Brazil’s continued incidents of police brutality. The military police’s massive counterattack is still ongoing and deploys helicopters as well as armored vehicles. Apart from the eight killings, a number of guns and drugs were seized and several arrests were made. In a sign that the battle against crime is heating up in other parts of the city, in Botafogo this Tuesday an operation to arrest a group of muggers caught in the act ended in a shootout which left three of the suspects dead. The latest spiral of violence comes against a background of significant rises in crime over the last twelve months.